Teachers who want to expand their knowledge, share instructional resources, and interact with others who have complementary professional interests are discovering that class is always in session thanks to the hundreds of regularly scheduled Twitter chats that happen each week. Collaborative conversations between like-minded educators from different schools - that previously and serendipitously only took place at conferences and on other irregular occasions - are now accessible to any teacher from any geography at any given time. Since 2009, hundreds of thousands of teachers have participated in Twitter chats to varying degrees. When you consider the volume of this unprecedented and cumulative knowledge sharing among professionals, who are trained to instruct and enlighten, it's not hyperbole to say that the impact Twitter and other social platforms are having on education is revolutionary. Before we get into why teachers are embracing Twitter chats, poke holes in the structure's inherent limitations, and showcase platforms that provide additional collaboration opportunities, here's a quick primer of how Twitter chats currently operate. 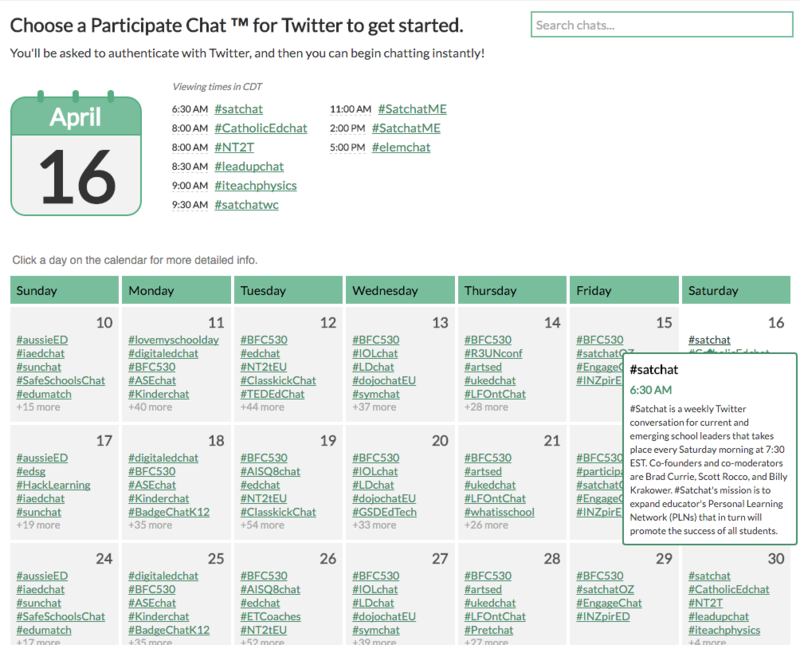 Twitter chats for (primarily PreK-12) teachers are anchored around hashtags that can be applicable to all educators (#Edtechchat), or specific to any given topic (#MineCraftED), age group (#1stchat) or region (#tntechchat). Typically, one or a team of organizers will informally claim a hashtag and then invite colleagues and others from their professional learning networks to participate in weekly (sometimes biweekly, monthly or sporadic) conversations. Chat durations are typically 60 minutes (some are 30 minutes, some are "slow chats" that occur over the course of a day. The hashtag serves as a common denominator for all tweets within a given chat or wider topic associated within that hashtag. Most chats begin with participants - often chiming in from all over the globe - introducing themselves to others within the chat. Within a few minutes, the moderator(s) will tweet an initial question typically preceded by "Question 1", "Q1" or some variation. Corresponding answers will most often begin with "Answer 1", "A1", etc. Questions are usually separated by five-to-ten minute intervals, and on average half a dozen questions are asked and answered throughout an hour-long chat. 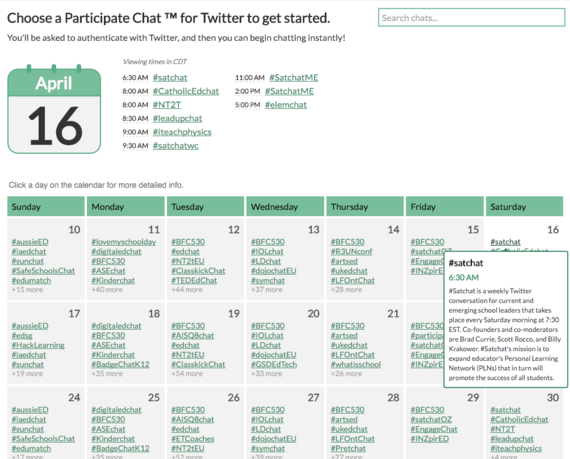 While hashtags cannot be claimed like a Twitter handle or Internet URL, Twitter chats for the most part are self-regulating, with a continuity of moderators, participants and topics from week to week. Chats, particularly trending and popular ones, attract a fair amount of spam. However, even the most gratuitous or political messages don't seem to disrupt the underlying conversation. Any educator who wants to create a community can find an unused or abandoned hashtag, announce a topic, and invite others to chat. One of the most popular and consistently excellent Twitter chats for teachers takes place virtually every Saturday at 7:30am EST. It is appropriately called #satchat. 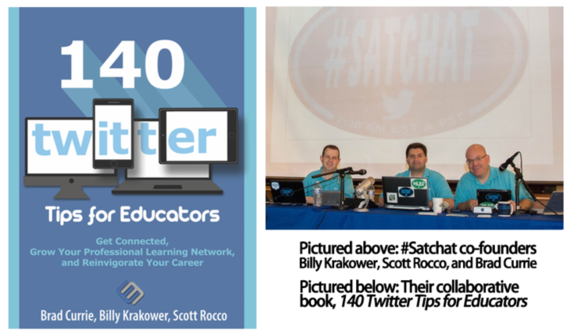 Started four years ago this week, #satchat and its regional offshoots attract thousands of monthly participants to discuss topics ranging from instructional technology, to bullying, to professional development. 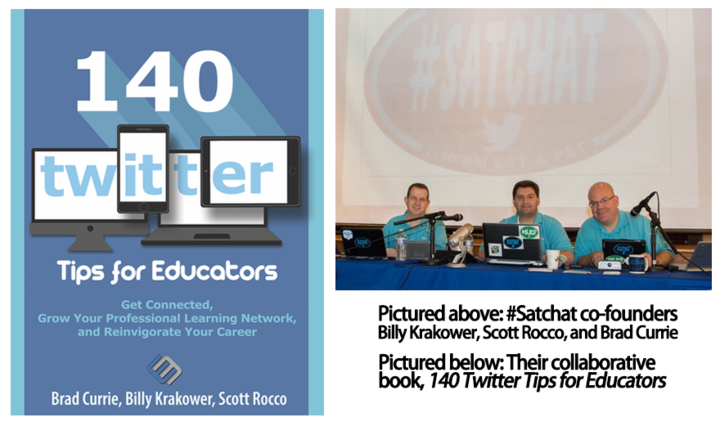 The trio behind #satchat - Brad Currie, Billy Krakower and Scott Rocco - just came out with a must-read instructional manual titled 140 Twitter Tips for Educators. The book, published by Dave Burgess Consulting, Inc., goes through in detail everything from setting up an account to hosting chats to launching your own business on Twitter. When asked why educators are drawn to Twitter for collaboration, Rocco, a superintendent in Spotswood Public Schools in New Jersey, replied that the social network makes it possible for the first time for teachers to "define our own learning and professional needs. It provides opportunities, collaboration, and resources whenever we want them." While there is a critical mass of technology and social media-savvy teachers on Twitter right now, it is only a tiny percentage of the millions of teachers around the globe who are not yet taking part in the conversation. As Rocco explains, "the limitation is getting teachers and administrators to connect and see the value. I believe the actual number of connected educators on Twitter compared to the total number of educators around the world is rather small." There are a number of challenges to onboarding teachers to Twitter and having them participate in Twitter chats. Some of it them are related to stigma - "isn't Twitter just a place to follow the Kardashians?" - while others are related to structure. The 140 character constraint, while necessary to Twitter's DNA, by definition has its limitations. It's cumbersome and time-consuming to sift through and learn more about all of the great resources shared in a given Twitter chat. On Twitter, virtually every statement is public and subject to misinterpretation from others who don't understand the conversational context. The Q1/A1 chat structure explained above is difficult to follow in real-time, meaning that many of the most insightful comments are never seen or read by others in the chat, snuffing out the potential for more in-depth and offline conversations. So while Twitter is currently the best place to find and connect with other educators, it is not really constructed for deeper conversation and collaboration. This is why communication tools like Voxer and Google Hangouts are increasingly used by teachers to continue connections and conversations that begin on Twitter. More recently, Participate Learning (where I work) launched a platform that makes it easier to engage in Twitter chats and deeply collaborate with other educators around resource discovery. "I have really enjoyed watching the resources for Participate Chats take shape. So much awesome! ", tweeted Steve W. Anderson of Web20Classroom. Anderson, along with Tom Whitby and Shelly Sanchez, co-founded #Edchat in 2009, and along with Tom Murray, Katrina Stevens, Susan Bearden, Sharon LePage Plante and Alex Podchaski of #edtechchat, Connie Hamilton of #TMchat, Steve Isaacs of #EdTechBridge and #Games4Ed and archivist Jerry Blumengarten are among the pioneers of the teacher chat movement. "So imagine, you have gone through your chat and you want to see the blog posts, websites, apps and more that were shared," he wrote. "Rather than going through the tweets, Participate Learning Chats gathers them all for you right there. Now you can combine those resources with the power of Participate Learning and send them to a collection to share with others, or come back to later." More recently, Participate Learning added the ability to view questions and answers in sequential order during chats and via transcripts that are generated immediately after each chat. This, according to longtime chat organizers and participants as well as others trying to onboard teachers less comfortable with Twitter, makes the experience much more accessible and meaningful. "Holy Cow (#TCEA8Chat) always moves way too fast," tweeted John Bimmerle, Instructional Tech Coordinator for TCEA Area in 8 Texas, who moderators regular chats for teachers in his district. "T hanks @Participatelrn for making a tool that allows us to moderate AND participate." Participate Learning Chats™ is integrated with additional resource discovery, curation and collaboration tools also available on the platform. Scholastic Top Teacher and influential blogger Erin Klein wrote that Participate Learning is a "lesson planning dream" as it has elements of Google, Pinterest and Dropbox all in one. 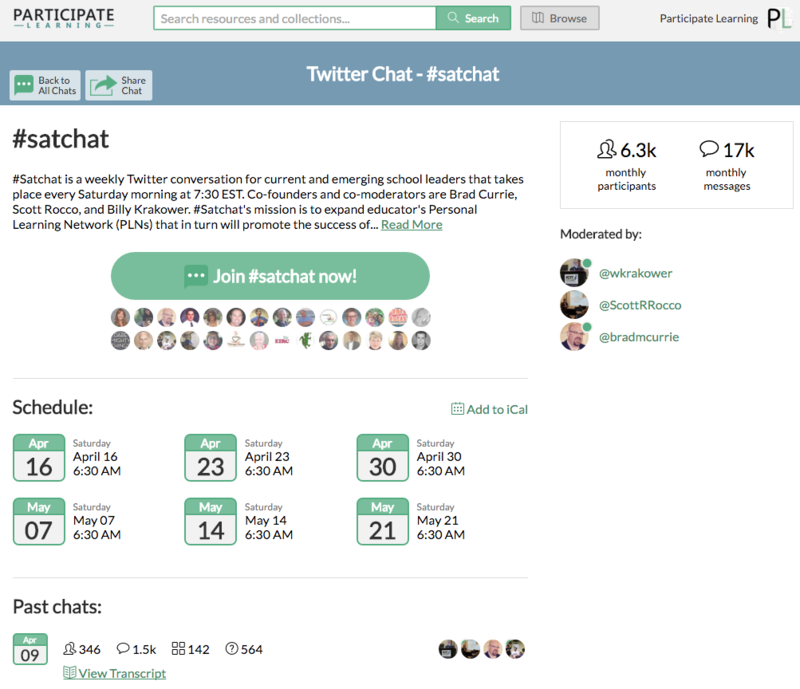 Combined with Participate Chats, which also includes a calendar and individual landing pages that moderators can update and promote for more than 300 Twitter chats, you can see how teachers can get more of their Twitter conversations on a platform developed just for them.